MY SOMEWHAT INAPPROPRIATE TRAVEL BLOG. 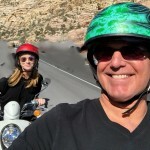 SCOOTER SELFIE at RED ROCK CANYON. Are vitamins better with red or white? Took my fish oil with a nice pinot grigio. When you wash down your vitamins with wine you know you’re in Vegas. But it was almost 5 o’clock…and way past Dry January. I like to gamble for 5 minutes and then take my chances at the shops. One store offered me a sample of a 600 dollar eye cream. It better be made from unicorn urine. Which reminds me I obviously need to refresh my Botox. We usually don’t stray too far from the strip. But this trip we took a scooter ride at Red Rock Canyon. It’s dry, red and craggy. Probably how my skin looked to the woman who thought i’d buy that eye cream. I want the beauty secrets of Diana Ross. She’s 73 going on 30. And we had a great dinner at Joe’s. We stayed at The Cosmopolitan. We had a tub with the view of the Bellagio fountain. I soaked in the tub. The husband may have gotten soaked at the casino. As we left i heard him quietly say goodbye to the money we left behind. But I still went to see Marianne Williamson. Every few weeks she gives a lecture in LA on the book A Course In Miracles. You step into the light. I’m going to try to give up grievances for Lent. 8 Comments for MY SOMEWHAT INAPPROPRIATE TRAVEL BLOG. Ah…my favorite place…got back just a day or so before I saw you were there. Stayed at the Red Rock Inn a few years ago…it was nice..but, I prefer the strip also…always stay at the Venetian…I think I own a wing by now..:) Don’t you love it when you are walking along feeling pretty good and the cute guy offers the free sample of wrinkle cream with the comment along the lines of…this would help your skin…okay buddy…go away..:) Heading back for St. Patrick’s Day…I look good in green..so, why not…:) Best to you, Dorothy. Miss you too! Love keeping up with you on your blog. You’re doing wonderful work with Mending Kids. Nash is soooo grown up and so handsome! I met him when he was one – yikes! If you figure out how to give up grievances, please let me know. Its a perfect thing to give up for Lent – I sure would like to figure it out! Happy Valentine’s Day! I saw Cher’s show in Vegas a few weeks ago. Talk about 70 going on 30. Love how Cher wears her old costumes. They still fit. Reading A Course In Miracles is truly helping me!